Where In Putney & Wandsworth Should Boris Put His Bikes? Where Should Boris Put His Bikes? The council has been lobbying for the popular bikes to be rolled out south of the river as part of the Wandsworth Travel Choices campaign. This new initiative aims to bring smarter, faster and greener transport options to the borough like pay-as-you-go bike hire, car clubs and new tube services. In July Mayor Boris Johnson announced plans to expand the scheme across parts of west and south west London in 2013. The enlarged area could include the area of Wandsworth which lies east of Putney High Street and north of the South Circular. Some 50 to 60 docking stations would be installed across this northern stretch of the borough if the roll out get the go ahead. Councillors want the scheme to spread into other parts of Wandsworth in future and will continue to work with Transport for London and the Mayor to explore ways of securing a further expansion. “Bringing these fantastic bikes to Wandsworth will ease the pressure on our roads and create space on overcrowded buses, tubes and trains. The scheme has been incredibly popular in central London and we expect people here to take to it in their thousands. “The roll-out would be a huge victory for our Wandsworth Travel Choices campaign which is all about providing residents with new and improved ways of getting from A to B. Continuing to improve the range and quality of our transport services is essential to the health and prosperity of the borough and is a top priority for the council. To suggest a location email Helen Griffin at hgriffin@wandsworth.gov.uk or call 0208 871 7983. There are currently more than 130,000 members of Barclays Cycle Hire with around 25,000 journeys made every week day. 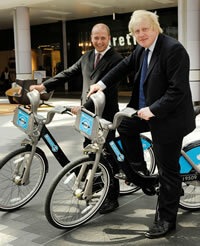 Cllr Russell King and Mayor Boris Johnson announce the cycle hire scheme is coming to Wandsworth.